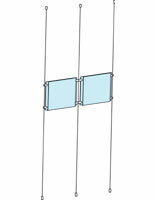 Need 8.5 x 11 floor-to-ceiling hardware designed to hold one of the most common sizes for paper on the planet? 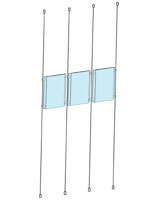 These acrylic and wire cable hanging systems are specifically geared toward those dimensions. 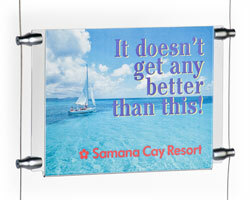 These acrylic sign holder kits are ideal for holding numerous letter-size images with one convenient showcase. 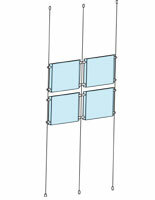 The kits of 8.5 x 11 cable hanging hardware will also offer convenience, versatility, and attractiveness! 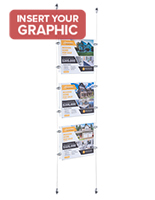 The 8.5 x 11 floor-to-ceiling hardware, like cable hanging systems, place your advertisements and sales information signs front and center, helping to entice passersby and potential customers into your organization. 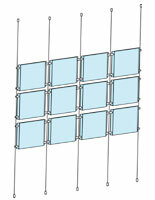 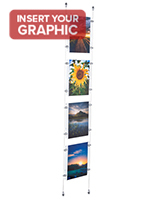 Options for an inexpensive, basic display and cables that hold one (1) single panel or a more expansive matrix for numerous images are both available. 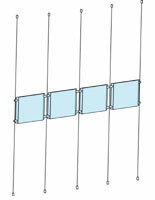 Use the cable hanging systems flush against walls as a display option. 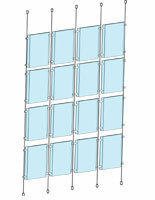 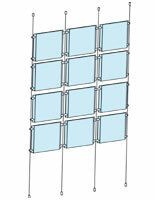 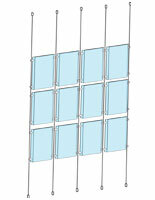 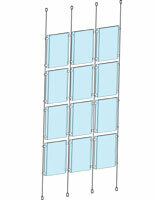 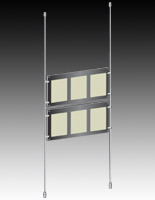 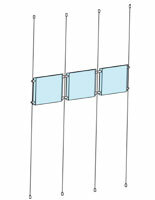 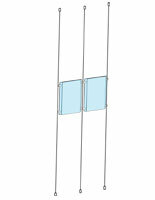 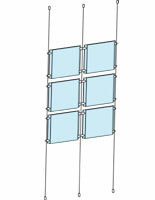 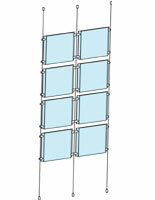 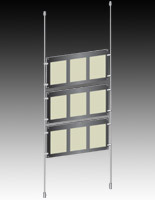 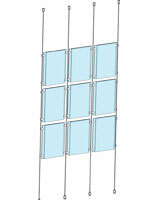 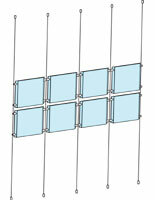 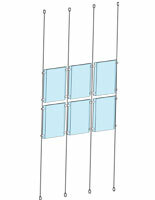 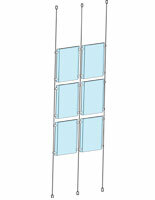 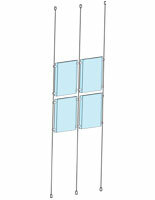 The practical acrylic frame and aluminum connectors bring a contemporary look with affordability to your window exhibits. 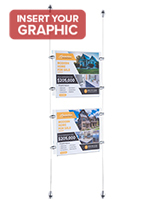 What business signs can be shown using the cable hanging? 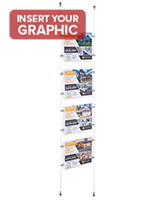 This 8.5 x 11 floor-to-ceiling hardware can be seen in travel agencies to provide pictures and information about vacation destinations & cruises. 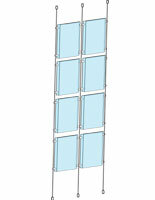 Retail stores utilize the hardware to announce new product arrivals, as well as informing customers as to the sales that are currently happening inside. 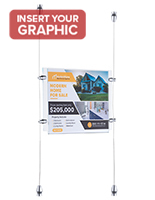 Real estate agencies use the aluminum connectors and acrylic frames to showcase pictures of the newest arrivals on the market in the front window of their office. 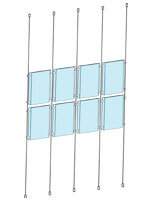 Restaurants place the acrylic sign holders to show the daily menu specials for their patrons, to allow people outside to check out the main menu before they go inside. 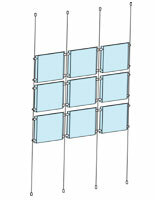 These systems can also be found in the front window of a coffee shop, informing everyone of what upcoming events are going to be happening. 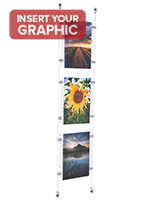 This equipment keeps the modern look of the 8.5 x 11 floor-to-ceiling kit for an upscale addition in exhibitions in art galleries. 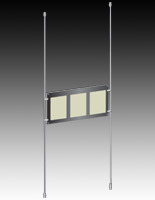 The variety of frames you can choose from in the 8.5 x 11 dimension category alone gives you many different options, including illumination. 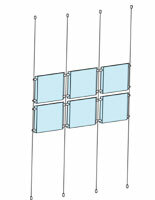 But that's not all that's included in this 8.5 x 11 cable hanging system. 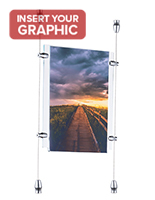 All of the hardware that you require to set up your signs included LED lighting if purchasing illuminated frames, is included with purchase. 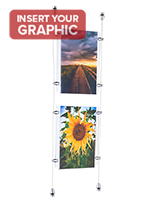 You'll receive floor and ceiling mounts, which include mounting screws and plastic anchors for the strongest and sturdiest setup possible. 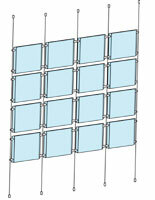 There're also the actual sign grippers to hold the separate panels together. 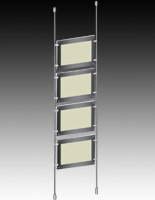 These are made from aluminum and have a satin silver anodized finish. 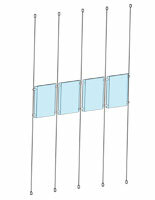 Each rope is made of stainless steel and comes in a 16 ft. length and has been coated in a nylon covering for added safety.